There’s a lot of uncertainty about how much money Uber drivers make and whether being an Uber driver is, as the company says, an ideal part-time job. Uber released a research paper on Thursday that claimed to give clear answers to those questions. It didn’t quite. The paper’s biggest claim is simple, and headline-grabbing: Uber drivers make more money than regular taxi drivers. This, along with flexible hours, makes being an Uber driver a good part-time job, in the paper’s judgment. On close reading, however, none of the data provided by the authors of the paper -- Uber Head of Research Jonathan Hall and Princeton economist Alan Krueger, working “under contract” with Uber -- support such claims. Let’s start with the issue of how much Uber drivers make. Uber has a lot of good data on how much cash its drivers take in from customers. But that’s just gross pay: It does not take into account costs like gas, insurance, or car maintenance and ownership. Uber hasn’t provided pay data that nets out those costs, which are necessary for any driver. In its marketing materials, Uber repeatedly presents gross pay data with language saying it shows how much drivers “take home (after deductions),” and then leaves it to a footnote to explain that those deductions do not include any of the most obvious costs of driving a car for money. 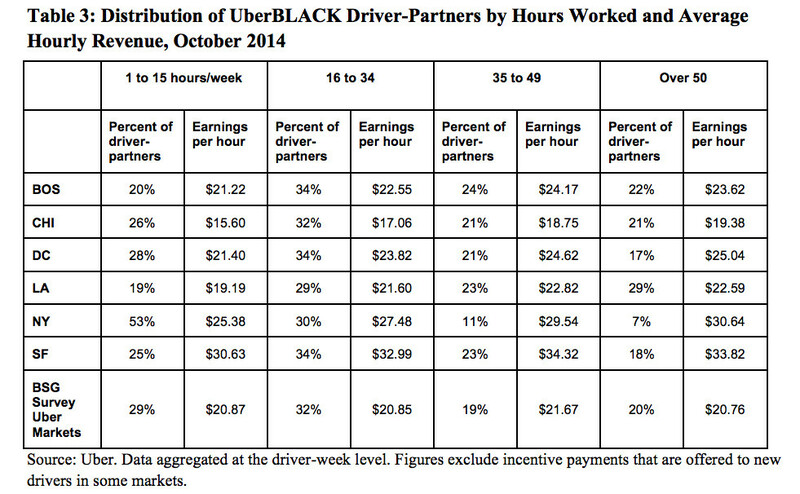 As a result, Uber is blurring the line between gross and net pay. The problem is that these are all gross pay numbers, but the two sets of drivers pay out costs in different ways. Taxi drivers tend to pay leasing companies to use cabs maintained by medallion companies, and also pay for gas, while Uber drivers are responsible directly for paying and maintaining everything they need to keep their car on the road. Simply comparing the gross pay of each set of drivers doesn’t tell you which set takes home more pay: You also need to know the costs of each set of drivers. 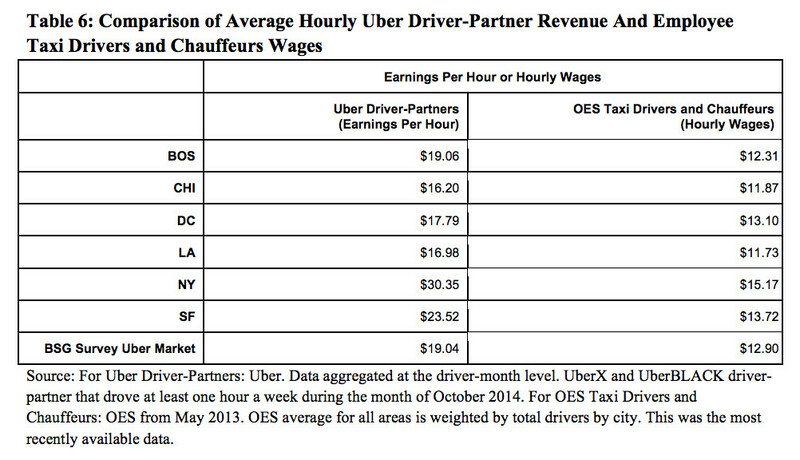 And this paper doesn’t address costs at all, aside from making this guess: “unless their after-tax costs average more than $6 per hour, the net hourly earnings of Uber’s driver-partners exceed the hourly wage of employed taxi drivers and chauffeurs, on average.” Krueger, who the report says had "full discretion" over the findings, told The Huffington Post that regarding gross wages, "The paper was careful to describe what data are available, and what was being compared to what." The authors want to study driver costs, but just not yet: “A detailed quantification of driver-partner costs and net after-tax earnings is a topic of future research.” Fair, but without net earnings, the paper has no support for its most important claim -- that Uber drivers earn more money than taxi drivers. Uber declined to respond to questions about why it did not include operating costs and fees in its examination of wages for the report. Then there’s the thorny issue of just how good a part-time job driving for Uber is. The paper answers that question emphatically: It finds that average hourly earnings don’t change much based on how many hours per week drivers work. That would indeed make driving for Uber a good part-time job: It’s nice to be able to predict how much you’re going to make per hour and not be penalized for working fewer hours. In the bottom row, you’ll see that average hourly earnings stay roughly the same -- about $21 -- no matter how many hours you work. The problem is that these are average gross earnings per hour. A different set of Uber data -- for drivers in New York -- shows that the fewer hours you work, the farther away from the average you are likely to fall. 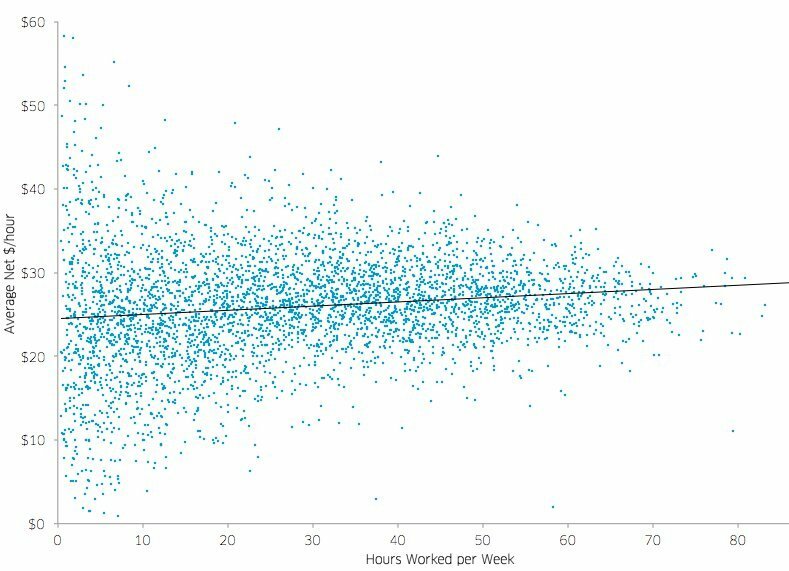 This is a chart of increasing predictability: The more hours you work, the more accurately you can estimate your gross pay. The less you work, the less you know. Extremely variable and unpredictable pay is not anyone’s idea of a good part-time job. Another question is how realistic the figures are on a month-to-month basis. Krueger told The Huffington Post that the study does examine how drivers' hourly wages vary from month to month, and concluded they were "fairly steady across months” in Uber’s six largest markets, with a 13 percent standard deviation. However, the standard deviation across all markets in the study is 19 percent -- that means that assuming a normal distribution, 68 percent of drivers saw earnings swing somewhere between positive and negative 19 percent month to month. The rest of the drivers saw their earnings change even more dramatically. All of this leaves us pretty much where we were before the paper was released. Uber's latest report offers plenty of information, without revealing anything important. Clarification: This story has been updated to reflect that the study found the standard deviation in Uber's six largest markets was 13 percent. It was 19 percent across all markets.